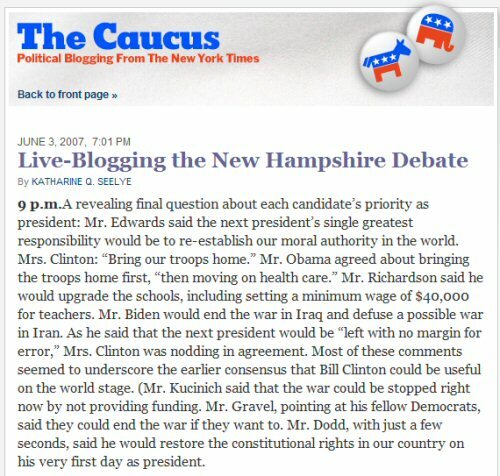 I just went to the New York Times homepage and saw that political reporter Katharine Seelye is “live-blogging” the democrat’s New Hampshire Debate. Newspapers and other mainstream media have had blogs for quite a while, but this strikes me as the moment when blogs officially went mainstream and when journalism crossed a tipping point of evolving into the digital age. The New York Times, “newspaper of record,” now brings you the record within minutes after the event happens. This is truly a sea change, and evidence that the New York Times is indeed changing its editorial standards online — that’s not to suggest that Katharine Seelye isn’t doing high quality journalism, but rather that she is on equal footing with anyone with a laptop, a blog, an a TV — and who has sufficient insight into American politics. Bloggers arenâ€™t an uneducated lynch mob unconcerned by facts. Theyâ€™re your readers and your neighbors and if you play your cards right, your sources and your community moderators. If you really play it right, bloggers are the leaders of your networked reporting projects. Get over the whole bloggers vs. journalists thing, which has been pretty much settled since long before you stopped calling it a â€œWeb blogâ€� in your stories. There is excellent work being done in the new world of online journalism and itâ€™s being done at newspapers like the Washington Post and the Lawrence Journal-World and the San Jose Mercury News and the St. Petersburg Times and the Bakersfield Californian and all sorts of papers of all sizes. You donâ€™t need millions of dollars or HD cameras or years of training to make it happen; all you need is the right frame of mind. Spyware Alert: Are Sites You Visit Spying On You?